New Delhi: In the spring of 2016, after meandering for three years, the Siddaramaiah-led Congress government in Karnataka made a decisive shift. Buoyed by a re-estimation of the size of its GDP, the state started borrowing heavily to fund key investments with the upcoming elections clearly in mind. While changes at the national level in the way the GDP was calculated created controversy, this went largely unnoticed in Karnataka. The estimated size of the state’s economy grew practically overnight, primarily due to a re-evaluation of the IT sector’s contribution. The state could now borrow more without breaching fiscal discipline norms. Even as borrowings went up, the proportion of debt remained flat. Siddaramaiah, who had a handle on state finances, having presented seven budgets before becoming chief minister, used this lucky coincidence to the hilt. With water becoming a significant issue, investments in irrigation and water supply got a healthy boost. Urban development also got special attention. The Bharatiya Janata Party often performs well in urban areas. The party won 12 of the 28 seats in Bengaluru even in 2013, an election it convincingly lost. Perhaps, in anticipation of that threat, the share of the state’s budget dedicated to urban development went up from 2.4% in 2013 to nearly 10% in 2016. In many ways, Siddaramaiah had started getting poll-ready in 2016, which may explain why the Congress is putting up more of a fight in Karnataka. The strategy of boosting social spending, while focusing on food and water security, is also very similar to the one which worked in neighbouring Tamil Nadu, where J. Jayalalithaa bucked a three-decade-old trend to come back to power in 2016. 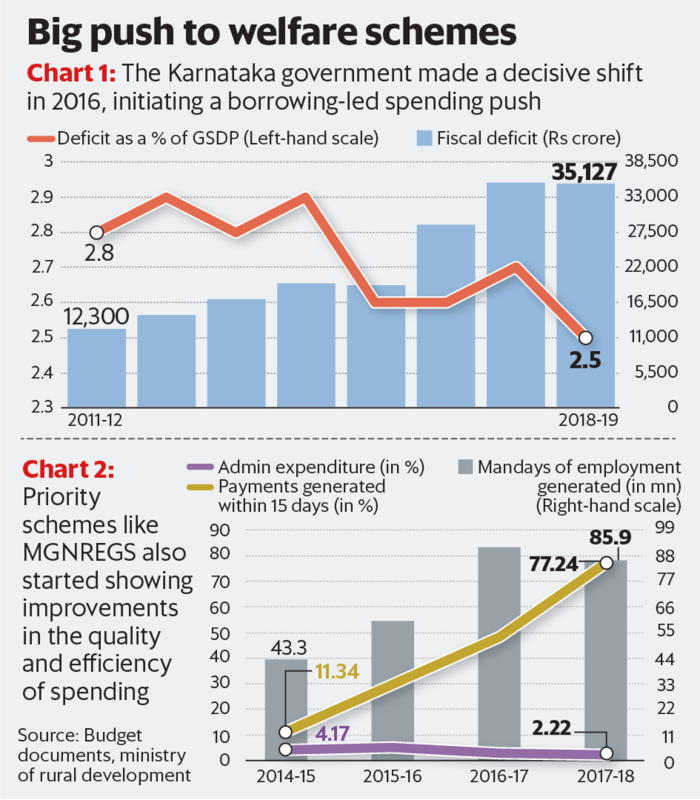 The fact that 2016 was a turning point in the run-up to the polls is borne out by how Karnataka performed in the implementation of the marquee rural employment guarantee scheme. Though 2014 and 2015 were the years when large parts of the country were under a drought, Karnataka’s quality of spending on rural employment improved significantly in 2016 —with the state ensuring employment for more at lower administrative costs and quicker wage payments (See Chart 2). There were, thus, two different administrations helmed by Siddaramaiah—pre- and post-2016. Congress’ fortunes will depend on which of those spells voters remember more clearly when the state goes to polls on Saturday.